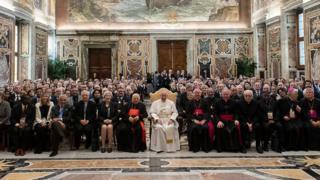 For the opening of the meeting, Pope Francis presented a letter to the Human Community, where he outlines the paradox of "progress" and cautions against developing technologies without first thinking of the possible costs to society. "There is a pressing need, then, to understand these epochal changes and new frontiers in order to determine how to place them at the service of the human person, while respecting and promoting the intrinsic dignity of all," Pope Francis writes. "Our ultimate aim of human evolution is immortality by replacing the flesh and bones with inorganic material," he said. "The question is what happens if something happens in the planet, or something happens on the Sun, so we cannot live in the planet, we need to live in space." "In this case, which is better? Organic materials or inorganic materials?" "This dream is a terrible dream," adding that it was "impossible" to divide the body and soul. "The flesh is the body with the soul and the soul is a spirit with flesh," he asserted. "The body is very important for human beings, through the body we love, through the body we embrace and communicate with one another," he said. "We are aware on one side this is unbelievable progress, but on the other side, we felt that are risks that this development can give the world. "The risk is we forget we are creatures, not creators." Creating robots that can do tasks humans can do, even intimate tasks like caring for elderly people or having a relationship, is a fundamental aspect of Prof Ishiguro's work. "We have a serious problem, the Japanese population is going down to half the number of the current population within 50 years." "We don't have enough annual immigrations, Japan is an isolated country, it's an island, our culture is quite different from other countries,"
"It is not so easy for the foreigners to survive in Japan in some sense,' Prof Ishiguro said. "That is the main reason why we are so crazy for creating robots." The European Group on Ethics in Science and New Technologies (EGE) released a report last year emphasising the "urgent and complex moral questions" raised by advances in AI and robotics. "It was on the request of the European Commission to have ethical thoughts about the future of our societies and the future of work in times of robotics and artificial intelligence," said Professor Christiane Woopen, chair of the EGE and Professor of ethics and theory of medicine at Cologne University, who was at the Vatican. The focus of the group's work is on how human rights relate to robots, rather than the idea of giving rights to new forms of autonomous technology. "We are not of the opinion that AI or robots should have rights on their own," Prof Woopen said. "Rights pertain to people and refer to fundamental rights, like human dignity, the right to autonomy." "Those rights refer to people, to human beings, and they refer to the EU Charter on fundamental rights," she explained. "Once a robot is going to be a partner, or a companion for us, a friend for us, we will want to protect the robot of course," he said. "As we give a kind of right to the animals, I think we will give a kind of right to the robots as well." "If you imagine that someday there will be a robot that completely behaves like a human being, moves like a human being, has facial expressions like a human being, how will you then decide whether this entity has a soul or not?" "We use them for our purposes, because we are the beings who can set their goals, who can choose the means, who can do good and evil, but we are free human beings," she says. "And I think that we shouldn't grant technical artefacts the freedom we have." The prize is for the best doctoral dissertation of 2019 on the subject of "artificial intelligence in the service of human life". Next year, the agenda for the Academy's meeting focuses on artificial intelligence. "We have underlined the importance of technical research, this is a really good gift that God gave to us," Archbishop Paglia says. "But when we become similar to computers, we immediately see conflicts, dangers, inequalities and sometimes a terrible slavery with the other." he says. 'We have to be faster in Europe," she said. "But I think governments have already learned that these are crucial aspects to regulate and deal with because this will just shape our societies without taking account of what governments say, if they don't."